Great cookies. They are worth breaking the diet! I talked with the owner about soaking their raisins in rum for his oatmeal cookies (I thought later, mixing rum & rum flavoring could maybe work well). Doesn't "Rum Raisin Oatmeal Cookie" has a nice ring to it? If anyone could make it, Captain Cookie could! The choc chip cookies are large with good sized choc pieces. The cookies are a perfect accompaniment to ice cream, hot choc, or tea. I wish Heath Bar cookies would make an appearance as well as M&M cookies. Also a regular choc cookie is requested along with one with M&M's and a choc Heath Bar. I am a big fan of soft cookies, and these cookies were big and soft! I can see why some people would say they are undercooked, but they are just about perfect. The chocolate ice cream was incredible: rich, creamy, and high quality. The scoop is smaller than I was expecting, but it was rich enough that I didn't need any more than that sinfully delicious scoop! This was my first time having Captain Cookie and it was really good. The cookie is soft and cooked all the way through (not doughy. The ice cream fresh and creamy. I will definitely come to this truck again. This was a perfect addition to my lunch. 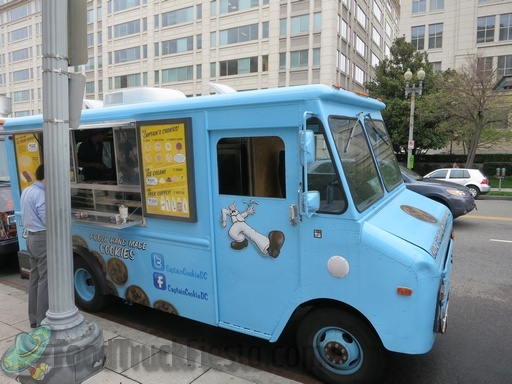 The cookies are very good, but the ice cream is why I am a frequent customer of this truck. 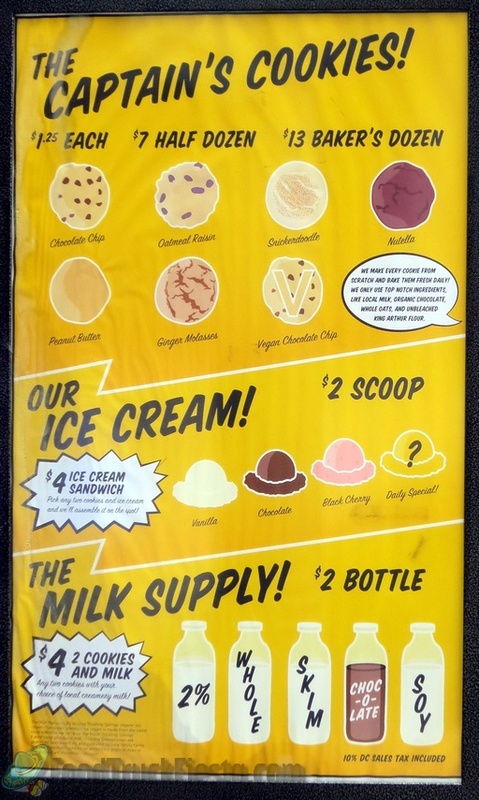 The chocolate ice cream is fresh, high quality, and simply delicious. The choc chip cookies have a salty taste - Sea salt is probably used. The saltiness gets in the way of the chocolate chips. I tried a maple bacon cookie and it was not cooked fully and bacon does not go well with cookies. Maple flavored cookies would be a bigger seller. best ice cream sandwich EVER!! 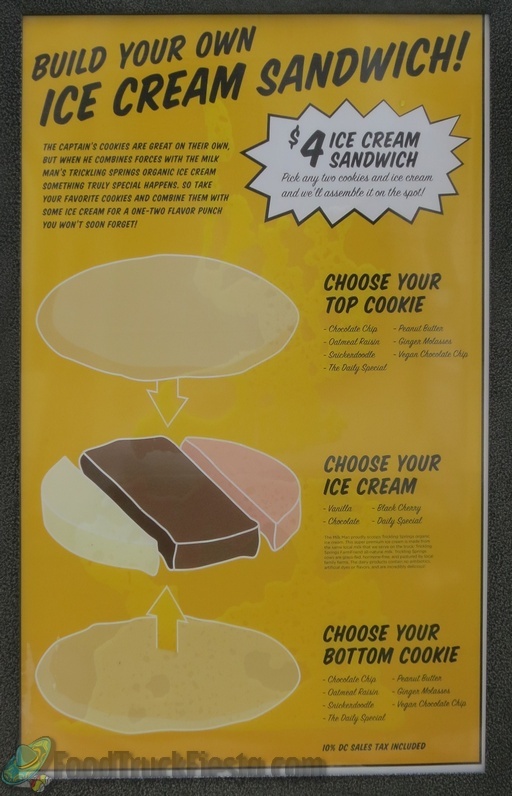 the cookies are always so warm and fresh, and the ice cream is just as good, imagine combining those two together! and the best part of all? they take into consideration about people with the nut allergy! The fresh churned Ice cream they get taste like it was made from the milk of angels. Cookie was delicious as well, big and chewy. The cookie was not cooked through, but even if it had been, it didn't have a very good taste. The chips were not too sweet and there were a lot of them, but the dough seemed to be greasy, and tasted like it was overcooked (but it wasn't). I think I'll pass by next time. I discovered this truck at the broccoli city fast and it was AMAZING!!! I had snicker doodle on the top and bottom. It was so soft, with PB&J ice cream... it was just delicious!!! Oh, and the customer service was great as well, especially for it to had been at this super packed event. 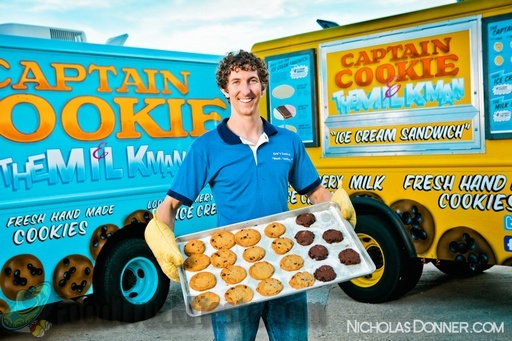 Captain Cookie and the Milk Man is a bakery truck that serves fresh-baked cookies, local creamery milk, and made-to-order ice cream sandwiches. 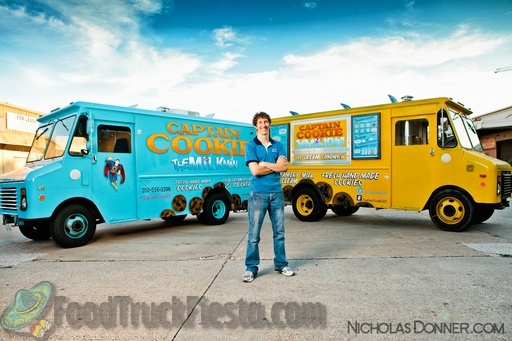 On June 21, they launched their second truck; it’s yellow!